This salted caramel recipe does not have salt as an ingredient. 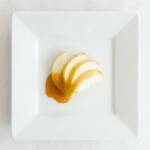 Instead, the salted caramel recipe uses something salty - miso! In a small cup, dissolve the miso in the water. In a medium-sized saucepan on high heat, combine the sugar and corn syrup. Add the miso and vanilla and stir rapidly to combine. Use however you'd like - drizzled on fruit, on fingers, on ice cream, or on cupcakes!